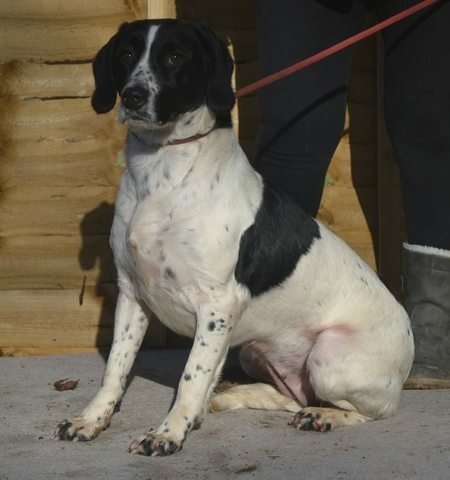 Didi is a female 2 – 3 year old English Springer Spaniel cross with a Labrador. She is looking for a quiet and understanding home. Didi was very timid when she first arrived but she is improving daily. She has been going for walks regularly, with various different people and other dogs, and now enjoys her walkies. She is much braver out and is used to the lead. Her favourite thing is sniffing in the bushes and grass at all the interesting smells. She is much less nervous and is comfortable enough to take treats and do her business while on her walks. In her kennel she approaches for a fuss and wants to be friends. Didi is good with other dogs. She follows everything her kennel mate does and gains confidence from him. Didi is really trying to come out of her shell so we think she’d come around quickly in a patient, understanding home. A kind canine companion would be a big help to her. Vaccinated, spayed, wormed, micro chipped and vet checked.